Well, there are just under two months left in the year. I think it’s pretty safe to say that I won’t finish my list of house goals for 2017 by December 31st. 😀 I’m actually perfectly fine with that. 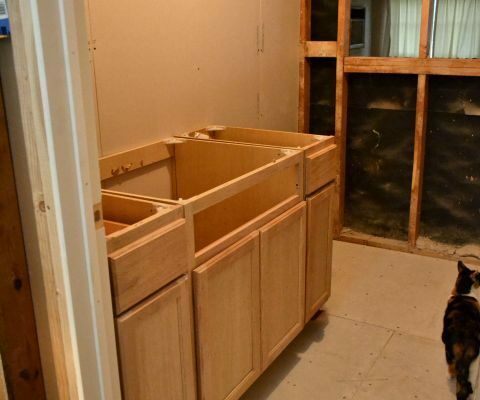 Unfortunately for some of you who have been patiently waiting for me to tackle my pantry, that’s the project that’s getting bumped to the beginning of next year. So the next almost-eight weeks will be all about my hallway, hallway bathroom, music room, and living room. My hallway is finally all trimmed out. I got the crown moulding, baseboards, and shoe moulding installed, and got all of the nail holes filled with wood filler. I have about 2/3 of those nail holes sanded smooth. So I have just a bit more sanding, and then lots of caulking, and I’ll finally be ready for paint. Gah! I’ve been working on this hallway for so long, and I’m quickly losing interest. You have no idea how much self-discipline it’s taking to stick with it. 😀 I have so many projects that I’d much rather be working on for my living room and music room, but I’m pressing on, because this hallway is soooo close to being finished. 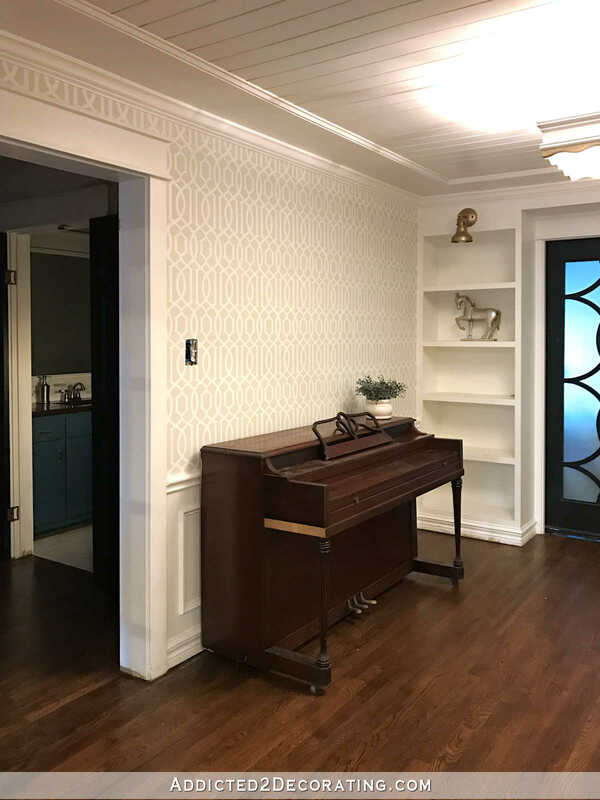 And as far as the walls go, I’ve decided on horizontal stripes in Behr Polar Bear and Benjamin Moore Classic Gray, which are the same two colors that I used on the stencil on the music room walls. They’ll be subtle, and I’ll finally get my stripes. 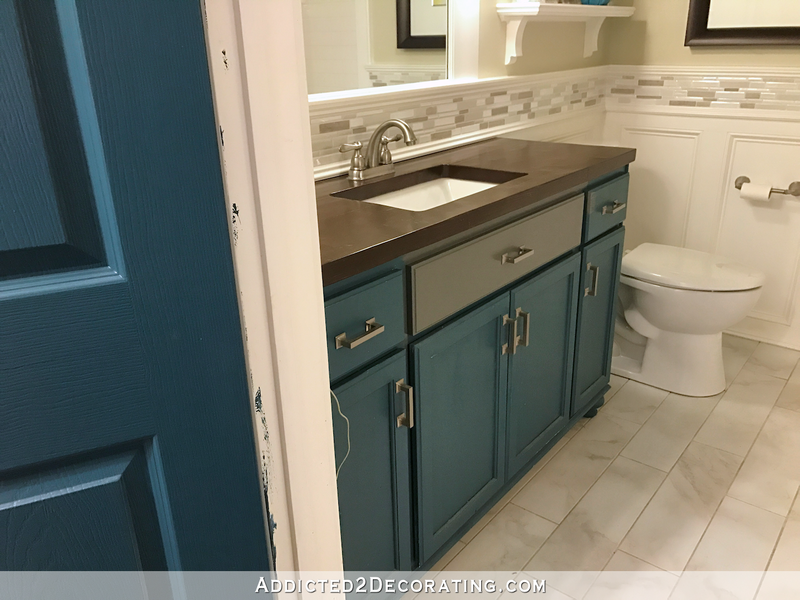 Once that’s done, the vanity in the hallway bathroom will need a new color since the current color clashes with the new hallway door color. The tile that I used in the border around the room has various shades of white, gray, and taupe, so I tried a sample of Kendall Charcoal on the vanity. I hate it. How can I love a color so much on my living room fireplace, but hate it so much on a bathroom vanity? It looks like my vanity has been smeared with concrete, and not in a good way. I have no idea how that will look with the light green wall color, but I have a sneaking suspicion that I’ll need a new wall color. If that’s the case, I’ll stick with Classic Gray. I’ve never been a neutral walls kind of person before, but it’s really growing on me. Anyway, progress is being made. Things are happening. I ordered a coffee table for my living room, which should be here on Thursday. I hope I love it as much as I think I will! I show y’all which one I chose on Friday (if it arrives on time). I wrote to the store owner to see if they’d get more of that trim in, but after getting no answer for the fourth day, I just decided to go with my second choice. It was a very close second, so I don’t feel too terribly disappointed. Anyway, before those items arrive and I get sidetracked even more, I need to get the hallway finished. It’s so close!! Your molding work is always so gorgeous. So, while you don’t feel like you’ve made much progress, I think you have! And, I love it! Not that you need my input, but I’ve personally found that a very, very, very, very, very light pink can be a great color for bathroom walls. It looks great against the skin. Not sure how that would work with everything else. Not sure you’d want a purple vanity with pink walls. Might look like an Easter egg exploded. But thought I’d mention it. Re the living room: can’t wait to see the sari trim! And, I thought you were going to just use the coffee table you had? Exciting progress! Oh, I forgot to mention why I bought a coffee table! I love my new rug so much that I couldn’t bear the thought of covering up so much of it with the ottoman. If the ottoman didn’t have the bottom shelf, it may have worked. But the bottom shelf is so low that there’s no seeing under it. So I decided I wanted something that doesn’t cover the rug so much, so I went with a very simple metal and glass design. Totally makes sense! I wouldn’t want to cove that rug either and I think a metal and glass design will be more balanced, given the overall color combo! Sounds great!! And, I think you owe us a wrap up post on the piano!! Id be thrilled if i could just do the trim you do! How about dark navy for the bathroom vanity? Your hallway is looking so stylish and classic already with all the door framing and the trim work. 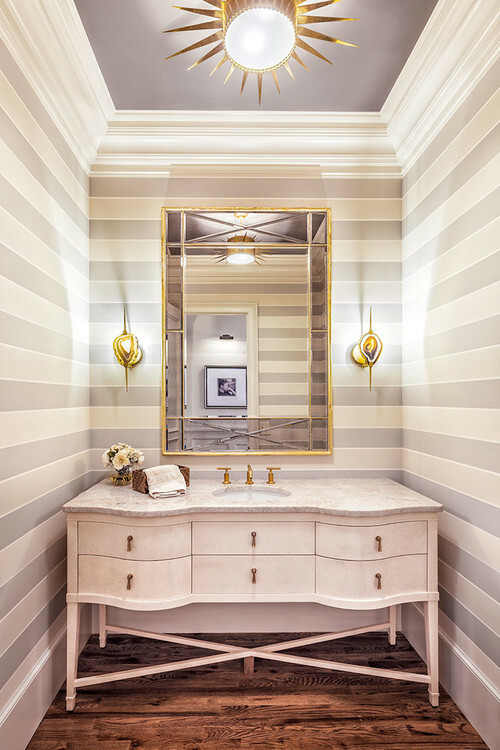 Great choice on deciding to paint the hallway walls in horizontal stripes the same colors as your music room. It’s going to look gorgeous! I agree, that the Kendall Charcoal does not do anything on your bathroom vanity…….yet looks amazing on your fireplace! What about trying your Behr Polar Bear or your BM Classic Gray on the vanity? Me too! While I might like the light purple, The whole area together might end up like a circus. I would treat the hall and bath as one unit. I have a question – I’m pretty good with caulking, but always seem to have problems at inner corners. Is there a trick to it? I’m getting ready to caulk my shower now that the glass doors are installed, but have hesitated due to this issue. Still hoping my painter son in law will take pity on me and do it! LOL! Some times, a girl just has to have her stripes!! I was looking at your tile backsplash over your vanity–what would it look like if you pulled out the darkest tan from one of those as the color for your vanity? More tan than get? It might blend for you–For some reason my eye was searching for that tone? You’ve accomplished so much this year!!! Whatever you decide upon always looks so great!! More tan than grey ( not get😂😂)– but, GET IT GIRL!!! Personally I like all shades of green and purple together so I don’t see why the walls would need to change if you painted the vanity purple mist. But, on another note you could go with a coral vanity. You’ve been trying to use coral some. Why not venture out? Agree. I really like it as it is now but can see how the blues don’t go together. I’d leave it just like it is and change the vanity to a shade of coral. That would be very pretty! Painting the vanity the same as the trim and molding was my first thought as well! So not as much time is spent redoing projects! I like the idea of black or the trim color, as someone stated above, to let your beautiful hardware, artwork, and tile stand out. 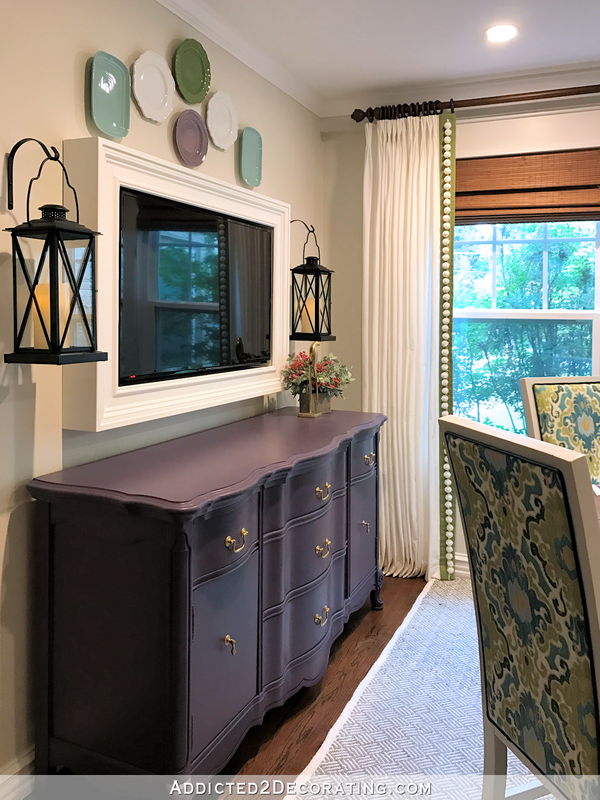 I love the “wow” painted furniture pieces in your house and the daring colors you’ve pulled off, but maybe the vanity doesn’t need to be one of those eye-catchers. You have some fabulous pieces that earn their statement color (purple buffet, for sure! ), but the vanity would be just as nice acting as a team player. It’s a foundation piece, like jeans or a little black dress that you pair with a great statement necklace. I love those soft light purple that was in the picture with the stripped walls. Can’t wait to see what you choose. One of your loyal readers, probably! Oh, your comment didn’t copy. I was referring to who may have bought your favorite sari trim right out from under you. I wonder how many of us talk out loud as we scroll through your posts 🙂 I got to the grey for the vanity and went uggh noooo and then I read on. I just love how the hallway is turning out. I think the bathroom would be so pretty with the behr white and then you could do your magic with your artwork etc. The light purple would be beautiful too with the tans. Loving it. Your home looks so beautiful, all the colors and details! Love it all. A total delight to the senses! I really like the colors of your doors in the hallway. SO delicious! Would it be awful to paint the vanity the same color as the hallway doors? Or, paint it the same as the trim in the bathroom, as someone above suggested. That way it would blend into the walls and make the bathroom look larger. JMHO. I was thinking something similar–a lighter tone/shade of the door color. 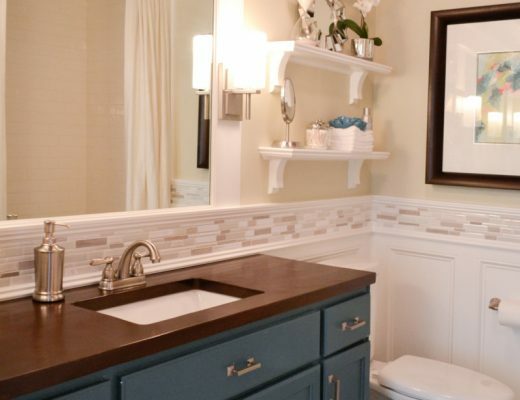 Take a look at Sherwin Williams Soulmate for your vanity. It’s a very pretty shade of light purple. It might be just what you’re looking for. It’s hard for me to judge the kendall charcoal on the vanity next to it’s current color. It could be that is what you are reacting to- but if it was all charcoal maybe you’d like it better. 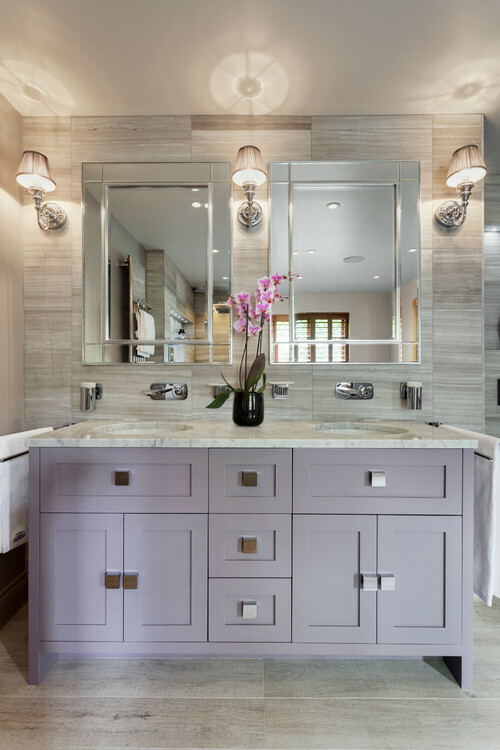 I like the current color of the bathroom and it looks to me that it would go with a light plum just fine. I know how you feel about your hallway and losing interest. We’ve been working on our family room for almost 4 months (we both work full time and have to help care for elderly parents) and we still need to complete it. The fabric is ordered for the roman shades and I have the components for a small lampstand but it seems like life keeps getting in the way. The holidays and family gatherings are coming up so I HAVE to buckle down and just get it done. Hang in there, my cyber friend, and just get it done! I am probably in the minority, but I love the Kendall Charcoal for the vanity. When I first saw it, I agree that it looks rather blasé next to your current color. But when I covered the teal color and could see just the charcoal color with the rest of your room, I think it looks fantastic! But I also really love Kendall Charcoal… our master bedroom is painted in that color. I know that whatever you choose, it will look great! It always does! 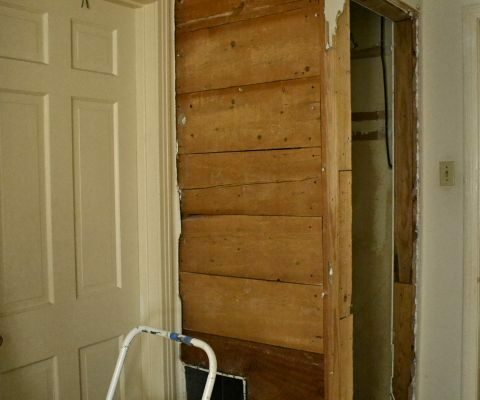 Weren’t your doors originally black in the bathroom? Why not put them back to whatever color you had before and keep the doors closed? I think black on the vanity would look great with the wood top, knobs and wall color. Can’t wait to see your hall walls complete. What’s the bathroom going to look like when a guest is in it with the doors closed? 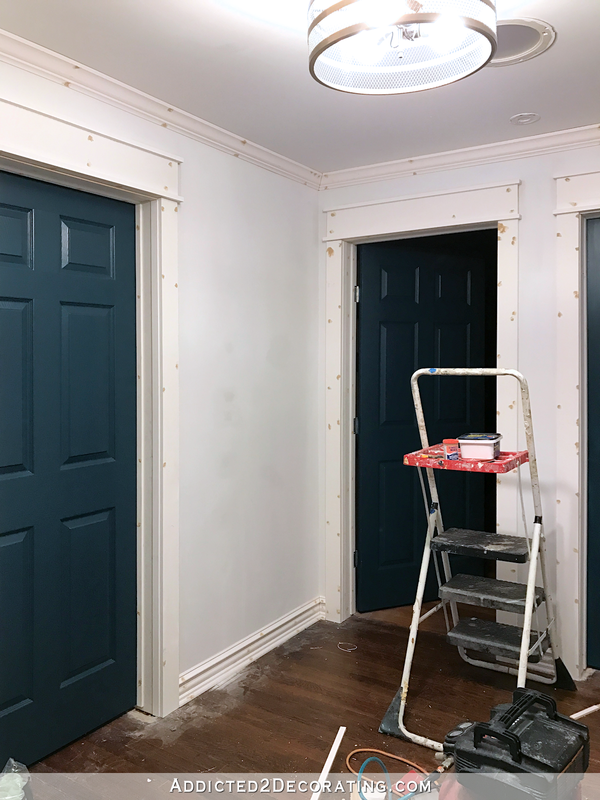 I think the lavender/violet is lovely but even with more neutral walls, having that color next to blue doors isn’t going to look so great and will detract from the beautiful work you’ve done in there. What about going with Polar Bear or the same color as the door? Polar Bear would look very modern with the dark wood countertop and nothing else would need to be changed. With the door color, you might only have to change the bottom of the shower curtain. If you really want to bring in lavender, you need to change the bottom of your shower curtain to something with blue and lavender, add some lavender into the art you did, and add some lavender hand towels and maybe a small accent on a shelf, a lot of work. Slightly lighten your hall doors color and use that on your vanity. At least try a sample before doing something that complicates the project even more(new wall color, shower curtain, etc.). So excited to see the finished hall! I, too, like the grey. You just have to see it without the existing color nearby. But my first choice would be light and bright – white or grey. Looking at the pictures, it seems you’re attracted to color but perhaps lighter this time around. Painting the cabinet white would give you the freedom to play with color in your towels or artwork. Those items are much easier to change/return. I don’t know how you do it. I’m exhausted just thinking about you having to repaint the bathroom vanity, then repaint the walls!